The European Chemical Industry Council (Cefic) launched an educational Web site—chemistryandyou.org—to raise awareness and interest in chemistry. The site—designed to be attractive to young people, while meeting the needs of secondary schools—is intended to show the overwhelming benefits chemistry brings to our daily lives. Although not designed for chemists per se, the site may be useful to those chemists who crave for their friends and family to understand how interesting, and indeed relevant, chemistry is. The site—available in French, English, Dutch, German, Italian, and Spanish—is one way that Cefic is helping to maintain the chemical sector’s long-term ability to innovate. According to Cefic, this ability begins in the classroom and rests on sustained investment in education and research. Whoever we are, wherever we live, chemistry is present in everything we do, improving our lifestyle and the world about us. While that might be difficult to explain in a few words, this site invites visitors to follow a day in the life of five different people. With Sarah, Thomas, Igor, Mee, and Barbara, one can explore how everyone has specific needs that relate to chemistry. As the site illustrates, from New York to Sydney we all expect the same things around the house, in the supermarket, and in the car. The site’s emphasis is on showing, rather than telling (so, did I say too much?) how science and technology affect everything, from the simplest gadgets to the most sophisticated satellite technology. In the first six months after its launch, the site received more than 50 000 visits. Launched in November 2003 during European Science and Technology Week, the site was marketed, with the help of a promotional poster, to 30 000 secondary schools across Europe. For more information on the European Chemical Industry Council, visit <www.cefic.org>. 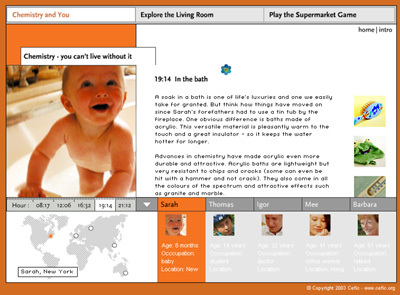 Page last modified 2 March 2005.